Monatomic Colloidal Products are extremely rare since the traditional outdated colloidal producers are stuck in a process that may be decades old and can only produce 10-20 PPM and only with the help of chemicals. precursor to the philosophers stone. are what we now refer to as Arthritis. Michael Faraday made many remedies from gold. the growth of the bacillus that caused tuberculosis. Since 1885, it has been understood that gold has healing capabilities for the heart and improved blood circulation. Used in medicine in the treatment cancer Including prostate cancer in men and ovarian cancer for women. Gold is reported to be beneficial for improving slow organs, especially the brain and digestive system and has been used to treat cases of glandular and nervous congestion and lack of coordination. It has been contended that colloidal gold increases mental alertness, mental acuteness and the ability to concentrate and focus keenly, accurately and the ability to absorb information that is often looked over. The body's temperature system is restored to balance, particularly in cases of chills, hot flashes, and night sweats and has an adjusting effect on the body, mind, and spirit. It is used to improve mental attitude and emotional states. The ancients believed that this mystical substance would facilitate extraordinary life-spans cure many diseases, and even sharpen their intuition. It may allow the body to operate close to perfection and is an excellent electrical conductor. There are many reports and commentaries, which state that it increases the ability of each cell to conduct better electrical impulses. There are hundreds of research findings that indicate that it has been used to treat Arthritis, Prostate Cancer, Cervical Cancer and many other ailments, including aging. It has also been used by Alchemists to make the legendary Philosophers Stone and the Elixer of Life also known as Elixir of Immortality. One of the key ingredients in making the Philosophers Stone is Gold. The Philosopher's Stone is used to transmute base metals into gold, all with the idea that the alchemist himself was transforming his person, into a perfect person, Spirit, Soul, and Body. Astonishing many of their writing give 100% credit and acknowledgment to God the Creator of the universe and everything that’s in it, and so do we. Furthermore, it is intriguing to note, how the Bible describes Gods throne room and heaven having Gold everywhere, to the points where even the streets are described as being made of Gold. Exodus 32:20, The Bible states that Moses: Then he took the golden calf which they had made, burned it in the fire, and ground it to powder; and he scattered it on the water and made the children of Israel drink it. (Colloidal Gold). It is a fact that Moses was schooled in the ways of the Egyptians, it has been reported that in the Egyptian empire, the Kings and Nobles also made Edible Gold which they consumed to gain immortality and a sharper spiritual connection to the powers that used to exist at that time. 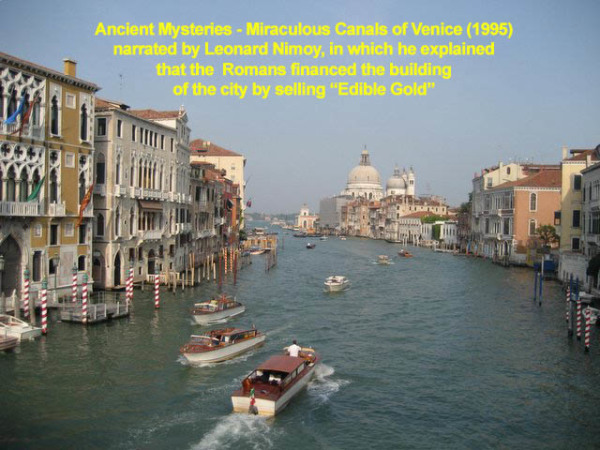 Ancient Mysteries - Miraculous Canals of Venice (1995) narrated by Leonard Nimoy, in which he explained that the Romans financed the building of the city by selling Edible Gold! Why eat gold? What process was used, and who made it? Were they gold colloids? The Alchemists of Alexandria are said to have made the Elixir of life also known as the Elixir of Immortality, made from that precious metal gold, they believed that it would rejuvenate the body, cure diseases, and restore youth and perfect health. In Old Europe, waters with gold were made to comfort sore limbs, in which at that time it is believed that they were referencing Arthritis. Paracelsus (1493-1541) and Michael Faraday In (1857) made many remedies from that shiny yet mysterious and beautiful metal and also used it to make the legendary Philosophers Stone. It was the Alchemist that developed silver salts to stop the bubonic plague! Alchemists hid their formulas in secret codes that the average Pious Religious person would shy away from, due to the strange symbols that actually represented Metals, for example, the sun = gold the moon = silver the crow = Carbon, the dragon = An Acid. Each alchemist had his own dictionary. Gold is much more than a piece of jewelry to be worn, it has a spiritual connection to the Most High which is why wars have been waged over it. James 1:17 (New King James Version) Every good gift and every perfect gift is from above, and comes down from the Father of lights, with whom there is no variation or shadow of turning. These products cannot get any more perfect than this! Now, this is God speaking to man, why would God want us to buy gold? It must be a special kind of gold, one that is clear as glass. Where can you buy it? Here! Revelation 22:1 (New King James Version) And he showed me a pure river of water of life, clear as crystal, proceeding from the throne of God and of the Lamb. Find out What are the Benefits and Uses of our Monatomic Colloidal Gold Products .